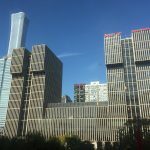 Having gone through a summer this 2018 with minimal to no Beijing pollution on most days, it was almost easy to forget that on some days Beijing is one of the world’s more polluted cities. Sure, there were days when the AQI would creep over the normal line and into orange. 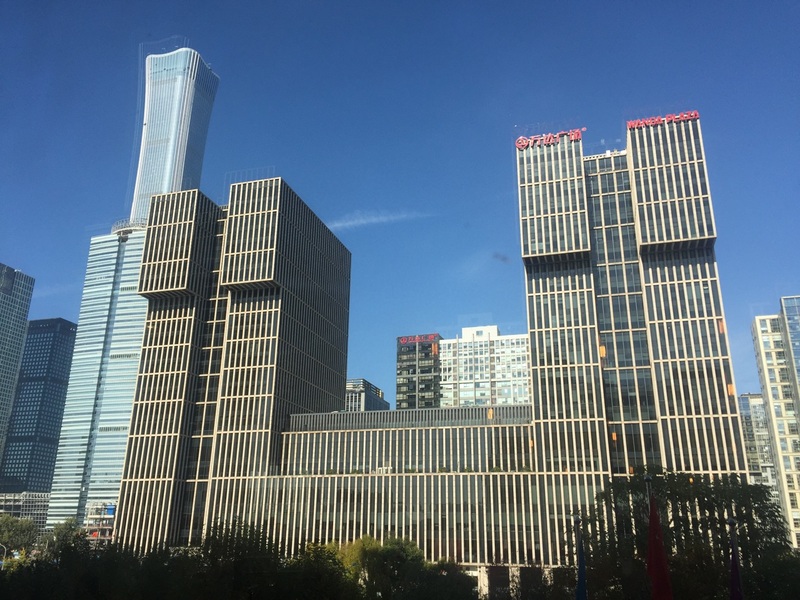 But, there were more blue skies than not this Beijing summer. Though, as winter rolls around and the fierce colds of the Beijing winter start to blow in, Beijingers and people all over Northern China turn to coals for heating – one of the reported reasons for pollution being such an issue in the North of China. It is still one of China’s most high profile environmental problems. The government are doing a lot to tackle it, particularly in Beijing. But like any problem, it takes a while to solve and the Beijing smog is not something that is going to disappear entirely over night. 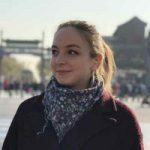 So when the days comes and the reality of Beijing smog settles in like a yellow cloud of dirt over Beijing city (or rather, literally exactly like that), just how do you cope with life in Beijing as an expat, battling the Beijing air pollution? Despite a few anomalies this year, the Beijing smog has been comparatively good compared with previous years. It seems that gone are the winters where you will spend most of the time hidden behind a mask due to the Beijing air quality being too bad to be able to see much of a distance in front of you. Only once (or maybe twice) did the CCTV tower disappear behind clouds of Beijing smog this year. However, there have been a few times that its glass exterior has needed a good cleaning post-Beijing pollution bout. There were a couple of instances when the AQI went over my mobile’s upper limit of 500. There was “that sandstorm” near the end of winter that caused the Beijing air quality to go off all of the China air pollution scales at over 999+… Sandstorms happen a couple of times a year, most often in spring when sand is blow in from the desert in neighbouring Inner Mongolia. Unfortunately, I did have to go outdoors on that particular day. I remember consuming probably what is considered as way too much sand (although I suppose any quantity of sand is too much sand to be consumed). Hopefully the improving Beijing air quality trend will continue over the months and years. And it’s important to know how to look after yourself on the days that are particularly bad, even if the majority of your days in Beijing are getting blue-er. Whether you’ve just arrived in Beijing, are preparing for a move to China, or you’ve been an expat here for a while, you can always find new ways to beat the pollution in Beijing. If you have any more of your own ways or specific rituals do let us know in the comments below! Firstly, learn how to know how polluted it is outside (without just looking out of your window). China air pollution is measured using a number, and easy to understand colour system. The number system is much more in depth and can get a bit complicated, with different numbers representing different types of air pollution (yes there’s different types – some more harmful than others). If you’re just after knowing whether to leave the house with a mask on or not, all you need to understand is the colour system. Which is pretty self-explanatory. 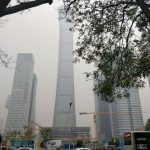 It still has a long way to go, and coping with China air pollution is something that expats have to deal with pretty regularly for those living in Beijing. That said, speak to long term expats in Beijing and they’ll tell you it’s only getting better in the city. There is genuine light at the end of the tunnel and the war with air pollution is one China is winning. Once you’ve figure out what level the pollution is, if it happens to be a bad day then it’s time to put on a mask. Yes, it’s annoying and not the most attractive piece of attire. It’s uncomfortable and arguably makes breathing more difficult… But wearing a mask (a good one, not just a cheap one…) will save your lungs a lot. 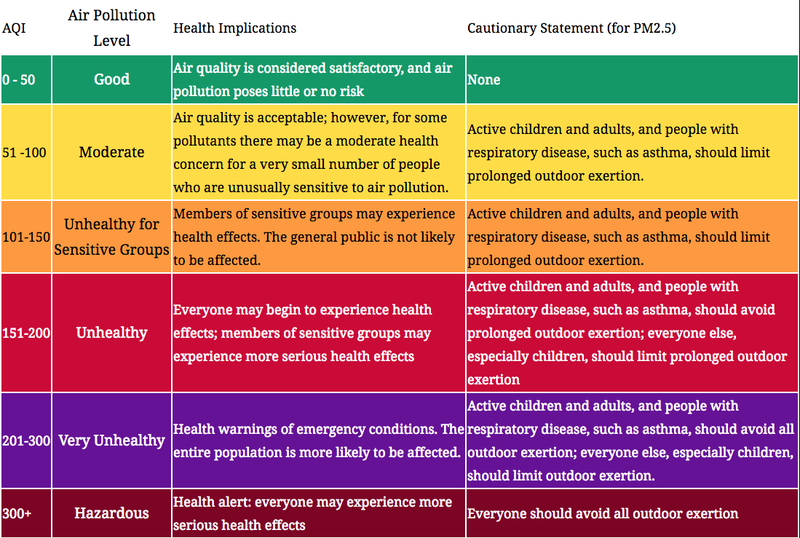 Follow the AQI chart’s guidelines to find out which days you should wear a mask. Bottom line is – it’s not a “fashion is pain” situation here. If the AQI is high, wear a mask. Plus, Chinese people (as well as foreigners!) don’t care. Wearing a mask may not be normal in your culture but it’s nothing out of the ordinary in Beijing. For us ladies, it means you can forget your make up in the morning and have a lie in! It’s worth investing in an air purifier to clean out the air in your house on a polluted day. As let’s face it you don’t want to be wearing your mask inside all day. There are plenty of options when it comes to purifiers. You could invest in a well-known brand, such as Xiaomi. These can be more expensive, but they’re effective and some models come with a built in pollution-omiter. You can watch as the air in your home gets cleaner. There are also some very effective budget options for filtering your air at home. 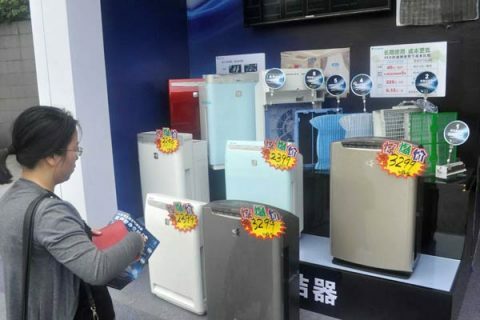 SmartAir is a well known Beijing social enterprise which makes effective and reliable purifiers for those on a budget. Perfect if you’re a student. Alright, this one is boring and kind of the last option. If Beijing is having an especially bad day and the pollution is serious it is advised that people stay indoors. You can turn up your air purifier to max power. You should usually listen to this advice, especially if you are particularly affected by the pollution i.e. have asthma. You can take advantage of China’s awesome food takeout apps and have a movie & food binge Beijing smog night. You should avoid exercising when pollution levels are high, and if you have to go for a jog try and stay away from high-traffic areas and wear a mask. 5. Head Out of Town! Why not take the opportunity of a forecast of a bad bout of bad pollution to take a long weekend and get out of the city? Sometimes you’ll find that smaller cities close by will have a much better AQI. Or if you’re sick of city life, head far off completely down South to the mountains landscapes of Guilin, or any of China’s beautiful scenic corners. We can also recommend a language trip to Beihai, where you can enjoy sunny beaches and learn Chinese. A good way to stay smart and be prepared for the China air quality to come is to by frequently checking the Beijing pollution forecast. This is just like you would do with a normal weather forecast. There are many websites you can use to check the Beijing air pollution and Beijing smog situation. Many of them contain all of the basic information, with some containing more detailed and accurate information than others. World Air Pollution index – Use this one to check the AQI around the world.